The idea of building relationship with learners wherever they are via OER was discussed in the Introduction to OER and Open Practices, a session hosted by the Higher Education Academy on the first day of OER13. According to the presenter, Tony Coughlan, the current evolution of OER and technology provides educators with the opportunity to expand relationship beyond the traditional teacher-students relationship. He highlighted that using the communication media preferred by the audience is a good strategy to impact them. Is reaching learners wherever they are feasible? This initiative is probably not within the traditional education paradigm in which students have to move to educational institutions. However, the UK Open University’s principle has been bringing the university to people rather than bringing people to the university. The Open University has done a good job in bringing education to learners but it has not addressed all barrier to education to find all learners in need. Practices in the recent MOOC movement reflect a step forward in bringing education to learners and building relation with them from their locations. With MOOCs, many barriers that exclude learners from education are indeed removed. For instance, the price barrier highlighted in the Budapest Open Access Initiative does not apply in the course aspect of MOOCs. Equally, the language test score barrier which is exclusive to many non native speakers is not an issue in MOOCs. Language test score barrier and cost barrier are to certain extent related in that language tests are quite expensive. Learners join MOOCs without paying any fee, neither for the course perse nor for a pre-course selective test. The MOOC experience is demonstrating that learning is indeed not linear and weaknesses on one side can be compensated by strength on the other. For example, more time commitment can enable learners with language difficulty to successfully complete the number of activities as proficient learners. More specific to xMOOC, their strength lie in their structure that can keep inexperienced learners who are really willing to learn. Of course, fast quitters do not benefit but those who persevere do. xMOOCs allow learners to go back to the course materials and repeat them in order to improve grades they had in quizzes. These courses have been criticized to go back to the behaviourist approach because of this aspect (Daniel, 2012, Bates, 2012). Arguably, learners improve their understanding of the course materials (and language abilities if they are not native speakers) as they keep engaged with the materials in order to make another attempt on quizzes. By spending 10 hours a week, an inexperienced learner or a learner with language difficulties might probably learn as much as an experienced leaner who spent three hours a week to learn the same materials. In this way, the two learners play different cards to reach the same goal in the learning game. The problem in selective education is the tendency to impose a single learning game card to all learners. More importantly, inexperienced learners might improve their abilities even if they do not learn as much as experienced ones. The most important contribution of MOOCs is not a comparison between learners, but the provision of opportunities for every learner’s self-improvement. Certainly, denying access to learners because of their financial, geographical, linguistic and other limitations does not provide such opportunity. On the contrary, everyone can enroll in a MOOC and quit whenever they want. Everyone learns through their personal experience. 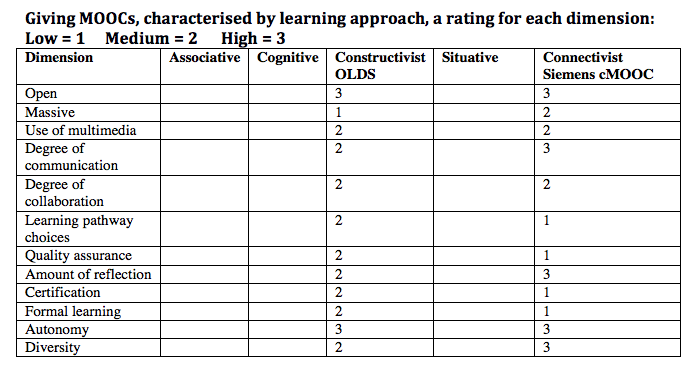 In this way, MOOC providers do not show themselves as too good for some learners by rejecting their application, which might lead to their social disempowerment (Lane, 2009). Moreover, the open licensing of MOOCs facilitates their translations in various languages which enables learners who have limited or no proficiency of the original course language to learn the content. Have MOOCs enabled reaching learners wherever they are? While MOOCs have considerably improved the reach of learners, a yes answer to this question would be too simplistic. The signatories of the Cape Town Open Education Declaration acknowledge that the majority of the world does not yet have access to computers and internet networks. Although the declaration was issued about six years ago, statistics from Miniwatts Marketing Group indicate that the lack of access to Internet connectivity is still the case to the majority of the globe population. To increase the access to learners wherever they are, the diversification is not only needed in the learning game cards, but also in the MOOC transportation channels. Hence, there is more job to be done in the open education endeavour. If MOOCs Have Limitations, How About MORCs? The recent emergence of Massive Open Online Courses (MOOCs) has sparked agitation in the academia especially in Western Europe and North America. Constraints raised by MOOCs vary depending on professional contexts or locations. While quality seems to be a major target of Western European and North American criticism, accessibility is still a major challenge for learners in developing countries. From my learning and professional experience, MOOCs represent a precious opportunity Rwanda never had. However, in their current dissemination mode, MOOCs are unfortunately not having significant impact beyond the traditional, highly selective, education in this country. Higher education enrolment is approximately 4-5 percent if not less. Though the exact number of people who are taking MOOCs in Rwanda is not known yet, connectivity seems to be a serious barrier to MOOCs. According to Miniwatts Marketing Group (2013) the Internet penetration in this country was only seven percent and this was the average penetration for the African continent as well. Even, for those who have access, the bandwidth is too poor to handle MOOCs. We will probably still have to wait for many decades for computers and Internet to become home tools in Rwanda as it has in developed countries. In this blog post, I would like to invite critical comments on quality and feasibility of repurposing MOOCs into MORCs (Massive Open Radio Courses) while transitioning into computer and Internet ubiquity in Rwanda. In my secondary education, I was trained to become a primary school teacher. That was back in 1990s. I attended a so called “Francophone school”. About 90 percent or more of Rwandan secondary schools were francophone as opposed to a few “Anglophone” schools. Naturally, I was supposed to teach in a Francophone primary school after my secondary education graduation. English was not on the list of courses taught in Francophone primary schools. During my secondary education, English language teachers were very scarce in the country. In my school, the priority for having an English language teacher was given to students who were in the literary section because English was one of the main courses which were assessed in national exams. In my section, Teacher Training Section, English was not assessed in national exams. For this reason, both students and school leaders did not feel pressed to find a teacher for this language. In 2000, The National Examination Council (which recently became the Department of Examination and Accreditation) was established. At approximately the same time, other reforms were introduced namely introduction of English and French at primary level in all Rwandan primary school and the shift from Kinyarwanda to French and English as languages of instruction from the third year of primary education. The British Broadcasting Corporation (BBC) had already been authorized to broadcast on Frequency Moderation (FM) in Rwanda and this became the case for the Voice of America (VOA). The two international radios broadcast incredibly nice English lessons which amplified my interest in English. Best BBC courses included “, Sad songs, the Lost Boy, Tell me a Story, Dictionary Update and Idiomatic Expression”. On the other side, VOA delivered New Dynamic English and Functioning in Business and English USA in addition to its VOA Special English in a slow-speed language to help non native speakers learn. As you can see, I now access the radio courses via the Internet but at the time, I used a radio to take these courses. Many of the courses seem to have been phased out. Since its establishment in 2000, the National Examination Council introduced an interesting system for recognition and accreditation of informal learning. The centre enrolled people who were not enrolled in secondary school to take the same national exams as those who were in formal secondary education. This system was commonly known as Candidats Libres or Private Candidates. Those who passed exams were awarded the same certificate/diploma of secondary education completion as formal students. The GPA in the national examination was also established as a benchmark for eligibility to students’ loan for public higher education. Although the national curriculums were prerogatives of secondary school teachers, many canditats libres or private candidates borrowed secondary school notes from here and there and studied for national exams. I personally enrolled as a private candidate to seek eligibility for a public higher education admission and loan. English which I had been learning mainly on the BBC and VOA was also added to the list of examinable courses for teacher trainees. Interestingly, this is the only course in which I scored a perfect grade (A). Similar to the National Examination Council, the National University of Rwanda (NUR) had a system for recognition of prior learning in languages. Students who joined the university had to take one year studying either French or English. During this year, they took the language which was not used for learning at secondary level. This system was widely known as EPLM (Ecole Pratique des Langues Modernes) in Rwanda. Prior to starting the language course, the university administered a target language test. Those who scored at the level evaluated to be equivalent or superior to the course outcome were immediately upgraded to their departmental courses without the year-long language course. This system also enabled me to spend four years rather than five at the NUR. Like the private candidates pathway, students who took this test did not receive any information on language skills they had to demonstrate or on graders’ expectations. In my case, all I knew was that I had to answer some grammar question, read a text and answer comprehension questions, listen to a passage and answer some questions, answer some vocabulary questions and write a composition on an open-ended topic. Two years after graduation from NUR, I had chance to win an award to undertake my graduate education in the United States of America. During my two year stay in the States, ones of the most exciting moments have been my touristic visit to Graceland, (Memphis, Tennessee), the home of Elvis Presley, my tour to various Washington DC monuments and museums and my meet up with DynEd. The specialty of these moments was that each of them was connecting dots of my learning experience that occurred a decade before. 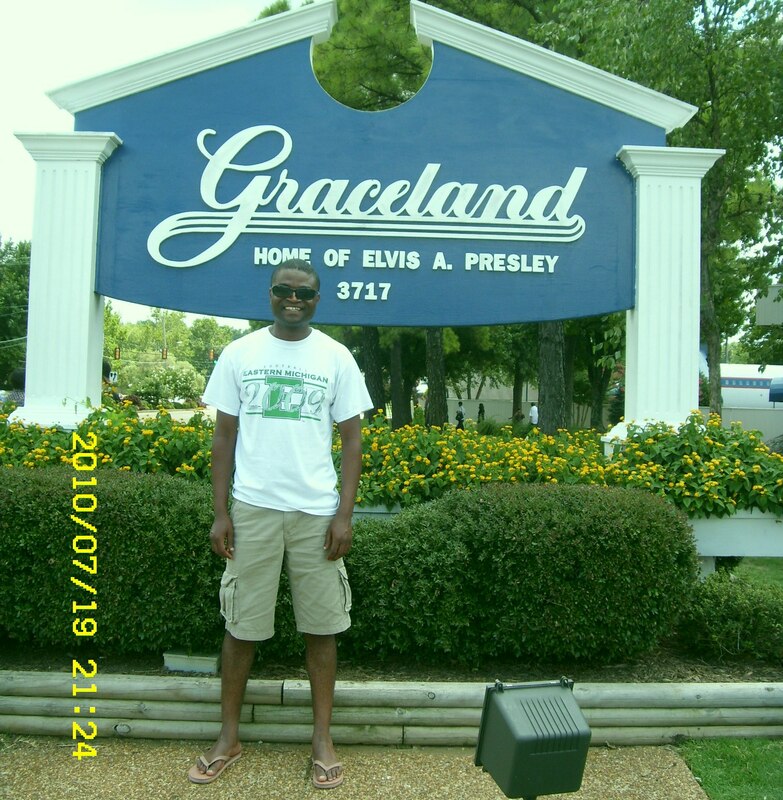 Starting with the Graceland visit, I became a fun of Elvis Presley in 2000 when the BBC was using his songs in “The Sad Song” which was part of the Leçon d’Anglais par Radio. This was an English course that was probably targeting the audience from the francophone Africa in a broadcast known as BBC Afrique. Elvis’s song were heart touching but his deterministic conviction was life changing. The BBC teacher quoted him in these words “As long as you believe in God, and you believe in yourself, do not let anyone tell you that you cannot achieve anything”. This quote came at the time an exclusive fallacy was being propagated in Rwanda. The fallacy claimed that people who were trained as teacher-trainees or in other “professional sections” are not well prepared for higher education. The proponents of this misconception said that it was difficult for people with such a background to succeed academic programs offered at university level and therefore they should not be eligible for students’ loan. After listening to Elvis’s words, my response to the fallacy was “Of course I can be successful in higher education”. This is how I became a fun of the “King of Rock and Roll”. Fortunately, the fallacy was not believed by many stakeholders in higher education. Institutions continued to enrolled students who had teacher-training and other “professional training” backgrounds. A bunch of these students made it successfully up to doctoral level. Briefly, visiting Graceland was a connection between the place and my English language learning experience, the nodes of my educational history activated by the BBC. 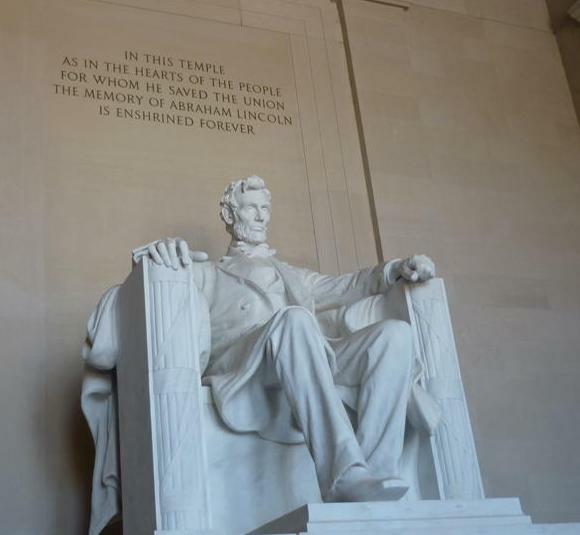 My visits to various DC museums and monuments and meeting DynED was also linked to my English as a Foreign Language informal learning. A survey of the museums and monuments was presented in Exploration, a unit of the VOA Special English program. I was hooked to this program since 2000. The power of Special English consists of the deliberate slow speed of the speech rate to help the target audience learn. The thirty minutes VOA Special English program used to be followed by two courses New Dynamic English and Functioning in Business, the lessons which were developed by DynEd . Some of the most popular MOOC providers include Coursera, Udacity and edX. Udacity was founded by Sebastian Thrun after his resignation from Stanford University. The highly prestigious university (currently ranked number two on the world rank of universities published by webmetrics) is among the most selective higher education institutions. After teaching the CS221 Artificial Intelligence MOOC, Thrun was surprised by informal learners’ accomplishment. The MOOC enrolled over 160,000 learners from all over the world. These learners studied the same materials and took same quizzes and exams as 200 students who were enrolled at Stanford University. Thrun offered the 200 enrolled students the option to choose between the MOOC and the face-to-face mode. After three weeks, the face-to-face class remained with only 30 students. Others 170 students had moved to the MOOC version, to learn with 160,000 informal learners. Thrun graduated about 20,000 learners. While the MOOC completion rate is criticized to be low (about 12.5 percent in this MOOC) this criticism is arguably of less importance. Basing on the percentage would be a simplistic view of the phenomenon. While 12.5 of completion rate might sound low, it should be noted that it is a hundred times more of 100 percent completion rate if the class were taught only to 200 enrolled students and all of them passed the class. In other words, there would be a satisfaction of 100 percent completion rate of 200 students which is achieved by excluding about 19, 800 successful learners from the course. According to Ripley, none of the top 400 score was from preselected students enrolled at Stanford University. She also notes that the 200 enrolled students’ performance in the midterm was a full letter above their predecessors who took the class in the face-to-face mode, the achievement she attributes to the online aspect. This leads to questioning the accuracy of selective filters used in traditional higher education. Koller, another Stanford University professor who co-founded Coursera seems to acknowledge that such selection suffocates many talents. “Maybe the next Albert Einstein or the next Steve Jobs is living somewhere in a remote village in Africa and if we could offer that person education, they would be able to come up with the next big idea and make a world a better place for all of us”, says Koller. If MOOCs are of low quality and are not adequately accessible in Africa, how about MORCs? I would like to draw this long blog post to a conclusion with a reflection to the initial question. More particularly, I would like to draw attend from the current buzz word, MOOCs, for a while to the probably equally influential mode. The MORCs (Massive Open Radio Courses) may have probably changed the lives of millions of people in the developing world. The BBC and VOA have probably been the biggest providers of this type of open education. However, research on the global scale of these two broadcasting companies’ educational impact seems to be lacking. Coming back to the MOOC quality, most criticism are prone to subjectivity. Admittedly, MOOCs have some limitations. However, which course or program is perfect? And if some courses are claimed to be perfect, are the evaluation process that resulted in their ranking as perfect courses universally agreed on? To what extent is the evaluation of education quality accurate if there is no common/standardized yardstick undertaken by institutions, programs, courses or learners/students that are evaluated? When Rwanda’s National Examination Centre established the standardized national exams, some of the unknown schools from remote corners performed better than many mythically prestigious schools. This centre also deserves credit for its contribution to fair admission and provision of student loan for public higher education. The practice of enrolling private candidates who were not enrolled in formal secondary education in national exams is also commendable. This enabled main of us to have a door open for tertiary education experience, the opportunity we were not likely to have otherwise. We underwent same exams as formally registered students and after passing the standardized examinations, we were treated equally based on each individual performance. Both the National Examination Council and the National University of Rwanda did not make an error in recognizing informal learning. Their sound judgment was indeed confirmed in the selection process for international scholar awards some of students whose informal learning was recognized won. But this is not an important point. The most important point I am making here is that no one should be denied access to education. It is even one of the fundamental human rights as articulated in Article 26 of the United Nations’ universal declaration of human rights. If we combine those best practices that have been in Rwanda for a decade and adopt the MORCs practices from VOA and BBC, we can provide access to high quality tertiary education to Rwandans. The participation rate can be increased from 4 percent to 10, 20, 30, or why not 50 percent and above? Good thing about the ubiquity of radio in Rwanda is that it is now accessed via not only traditional radios but also on most mobile phones. Rwanda would not be the first place where radio is used in education, anyway. This technology has been used at Indira Ghandi National Open University, the Open University and many American schools many years ago, probably when their technology development was still at the current level of Rwanda. Radio has also been used in Chinese higher education and probably in many other countries. 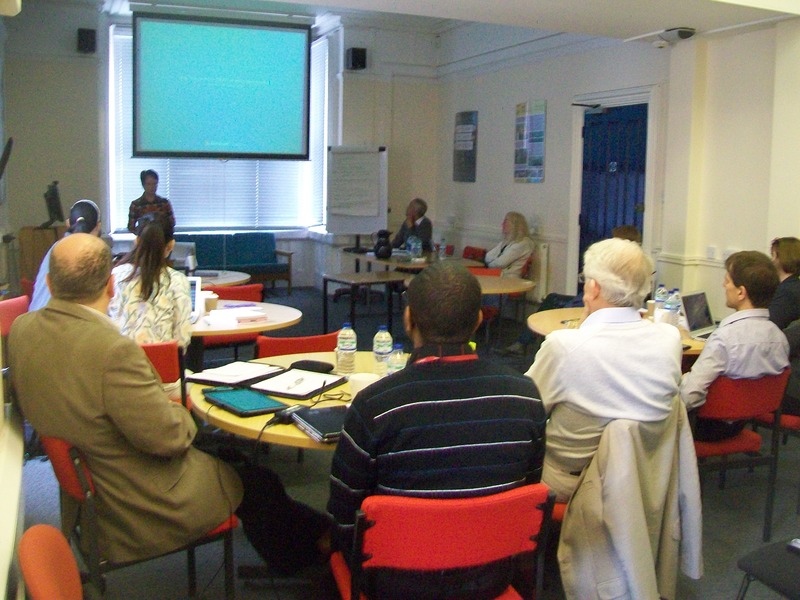 But again, VOA and BBC still deliver their English courses to the audience from various parts of the world. In a nutshell, giving up the traditional selective culture to adopt open standards, open policies, open curriculum, open assessment and open qualification framework would enable the use of the existing pool of OERs and MOOCs to provide access to anyone who is willing and committed to study in Rwanda. I might sound as a fun of traditional technology and not receptive to computer and Internet. However, I would argue that the value of these technologies rely on how positively they impact people’s life. The unthoughtful rush to join the global bandwagon of technologies advancement might lead to widening the digital divide, which would victimize so many people in economically disadvantaged families. Without excluding effort to increase the current computer and Internet penetration rate, my suggestion is just starting with available technology to open up educational opportunities to people. Then, as computer technology and Internet access significantly increases from the current 7 percent, the migration from MORCs to MOOCs would occur with a smooth transition. This is probably one of the strategies Rwanda might have to use to transform from subsistence farming to a knowledge and skill based society, a high aspiration on agenda.